The Kverneland Exacta CL GEOSPREAD is the ideal spreader for arable farmers and professional dairy farmers. The GEOSPREAD system does section control with sections of only 1 metre. With a maximum of 14 sections and the possibility to switch sections over the middle, unnecessary overlap is set to an absolute minimum. 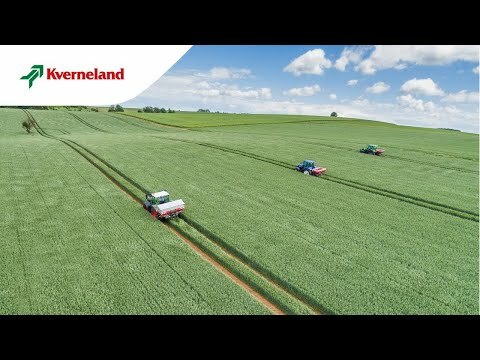 The 4 load cells and reference sensor on the Kverneland Exacta CL GEOSPREAD spreader are important features as with section control accurate weighing is essential. The total benefit of GEOSPREAD combined with speed related spreading and GEOPOINT headland management can be up to 15%. This can be achieved by saving fertiliser and better yields, because of unnecessary overlap. This Kverneland Exacta CL GEOSPREAD spreader is ISOBUS compatible and AEF certified. You can operate the spreader in combination with the IsoMatch Tellus PRO, IsoMatch Tellus GO or any other ISOBUS compatible tractor terminal.